Cinderella in all her finery, is getting ready to wow the Prince at the ball. 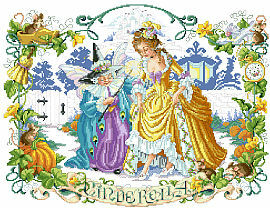 Surrounded by her fairy godmother and little mice helpers, this classic scene from the beloved fairy tale is delightfully interpreted in a unique way by Kooler Design Studio designer Sandy Orton. 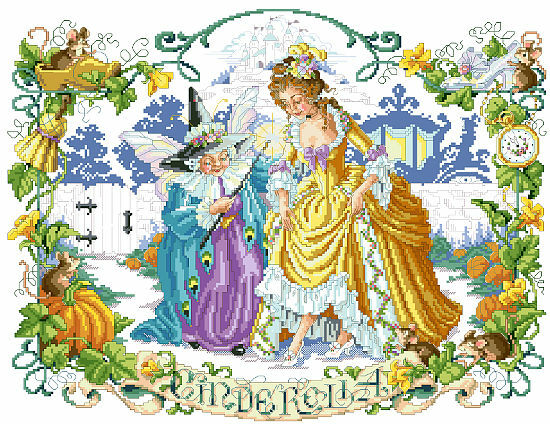 This princess design has long been out of print, but we are pleased to present it again, along with our classic Rapunzel and Sleeping Beauty designs. Contents: Stitch Count 238w X 182h, Finished size on 14 ct. 17" X 13"